Okra - Vegetable seeds? Buy high quality seeds at 123seeds.com. Fast delivery! 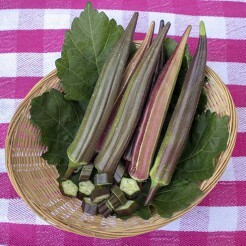 Okra is an exotic vegetable and you can grow it easily in our colder climate in a greenhouse or hothouse. Give the large plants a very sturdy support, enough warmth and water. Okra is relatively unknown, but it contains a lot of nutrients. Pick the fruits when they're approx. 6 - 8 cm in size. The flavour is much better. 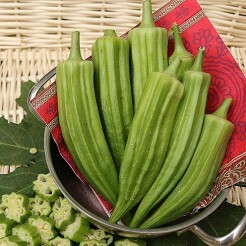 Use Okra in soups, stews, Jambalaya's, in dishes from Suriname and in Creole dishes.